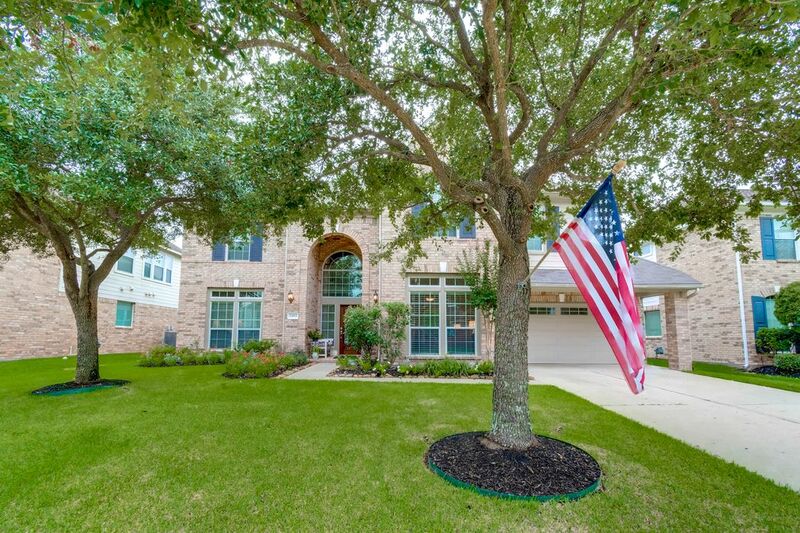 2403 Blue Water Bay Drive, Katy, TX 77494 | Martha Turner Sotheby's International Realty, Inc. 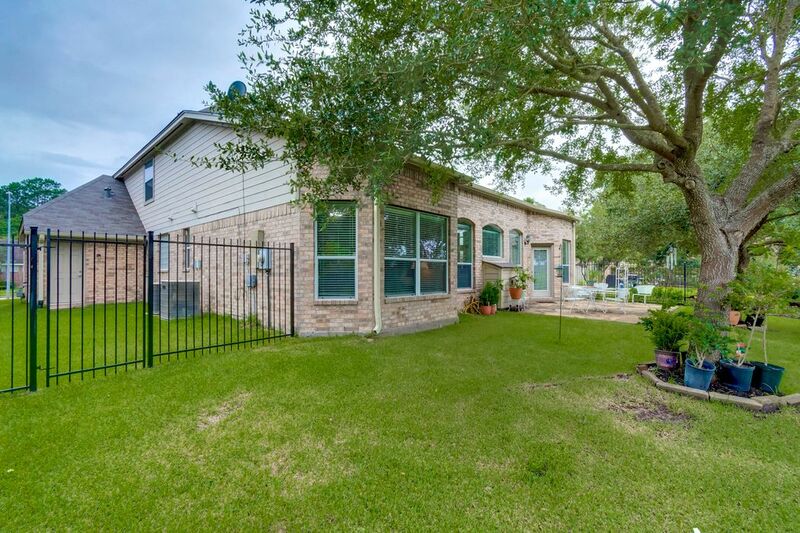 This home features beautifully landscaped front yard with large shady trees and is ready for move in. 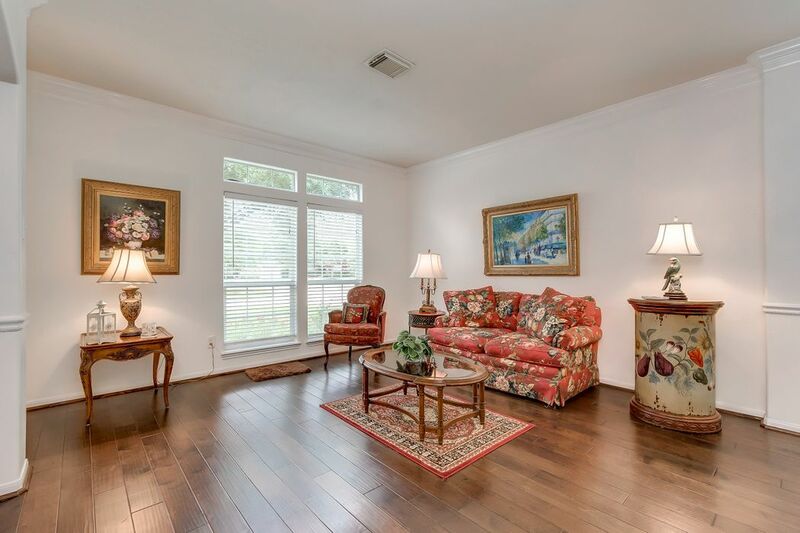 Another view of the formal living room showcasing the wood floors and large windows with lots of natural light. 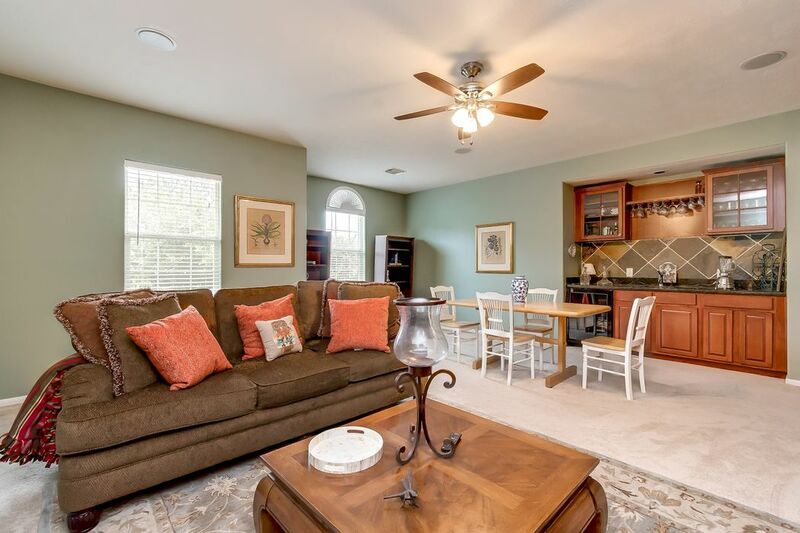 A great space for gatherings. 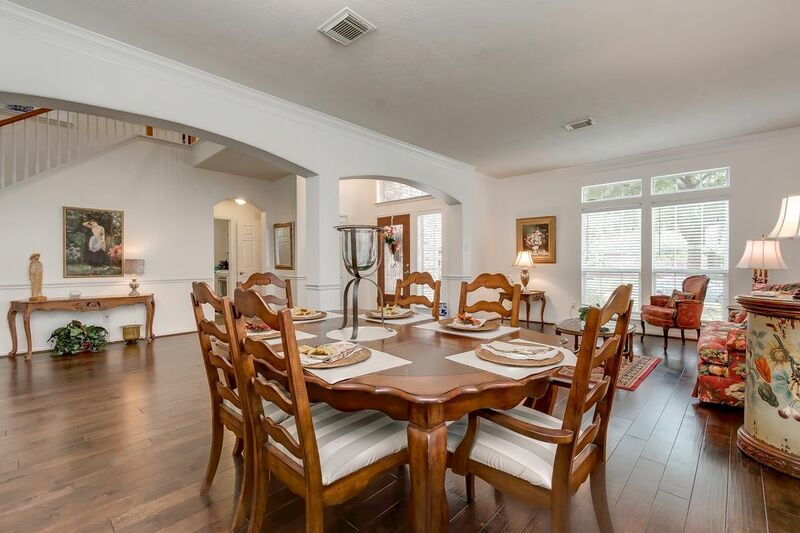 Another view of the formal dining area from the living room towards the Great room beyond. 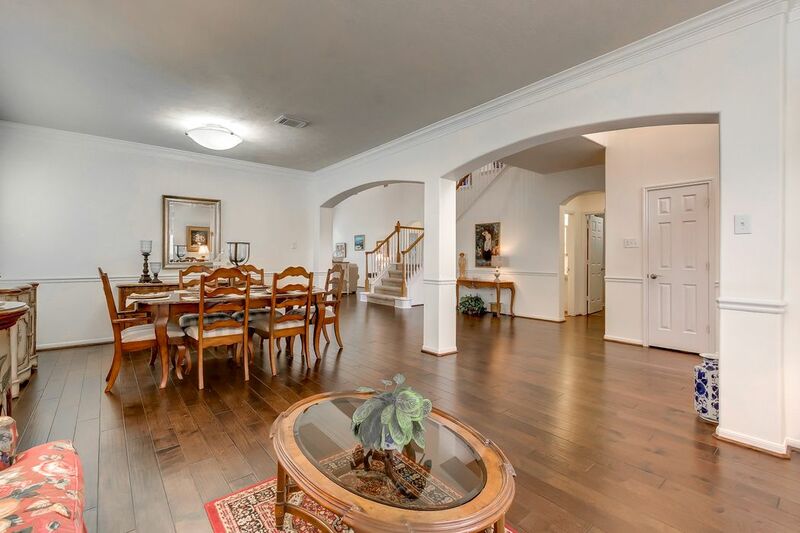 View from the formal dining room towards the grand entry hall all with crown molding. 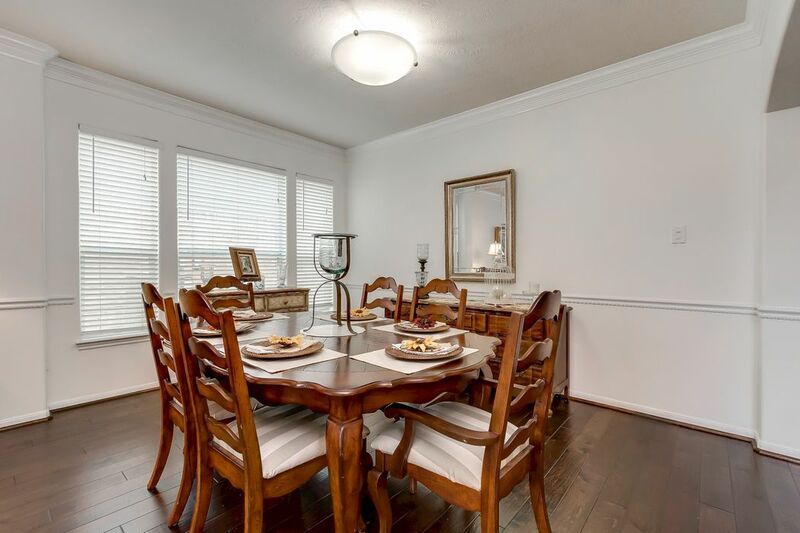 The openness makes it easy for nice meals and entertaining. 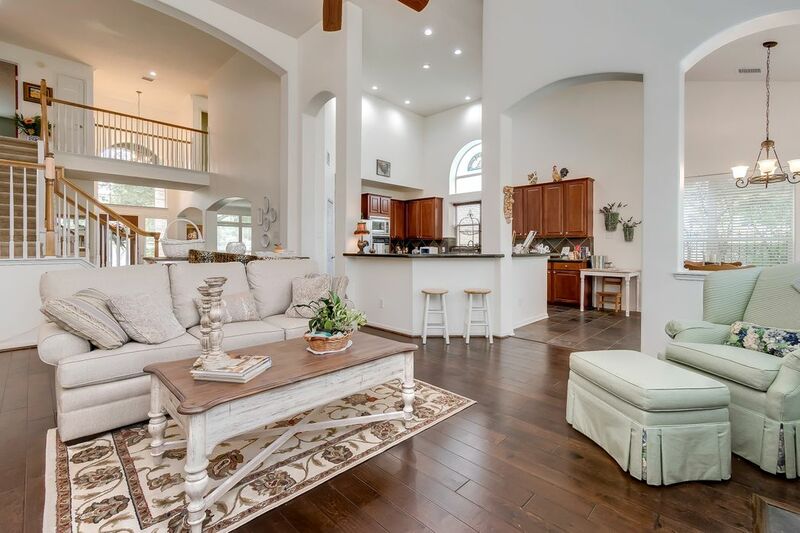 View of the Great room with soaring ceilings and arched windows, this room is filled with natural light and is highlighted by a beautiful fireplace with wood detailed mantle. All open to the kitchen and breakfast area. Another of the Great room towards the stairway and entry way, notice the soaring ceiling,arched opening way, and decorative niches on the way up the stairs. View of the Great room towards the kitchen. 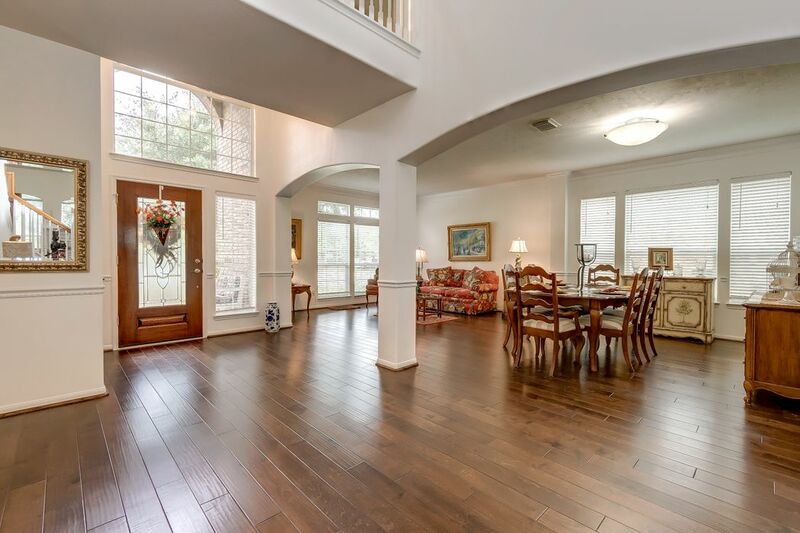 This open floor plan makes it easy to move around from the dining areas and into the Great room. 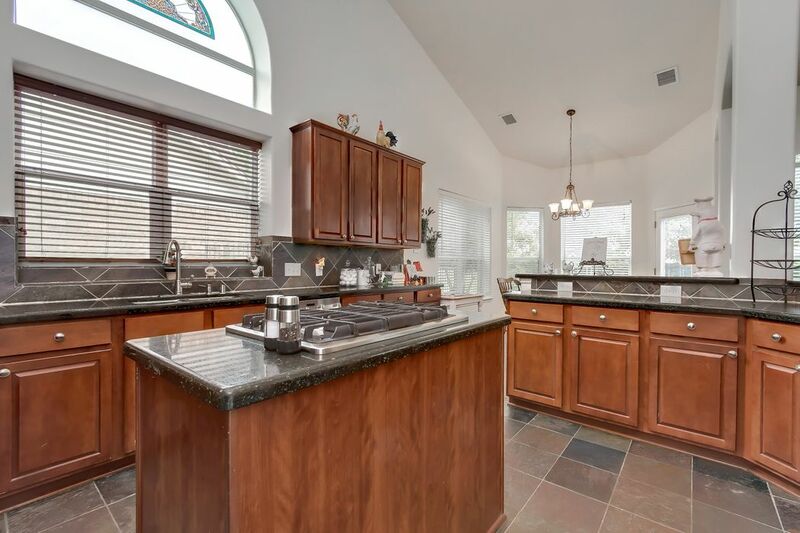 Another view of the recently updated kitchen , this kitchen is perfect for any chef, with plenty of counter top space and built in gas cooktop. 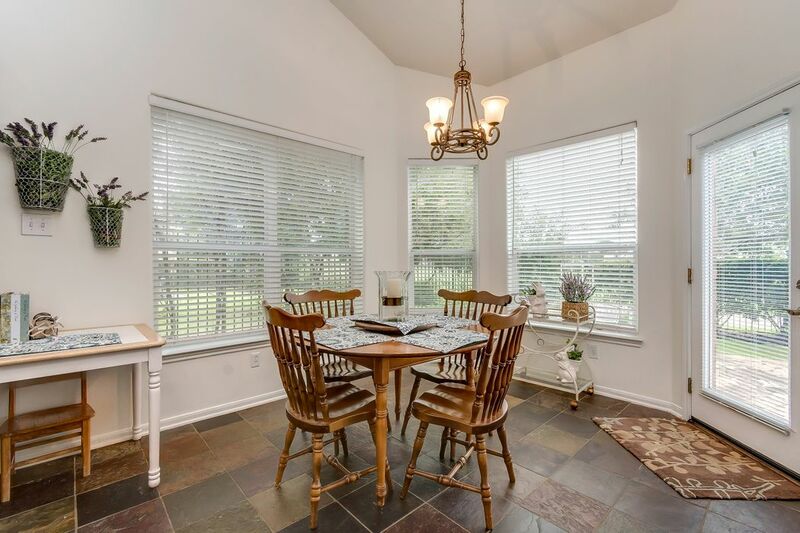 Light and Bright Breakfast area w/ tiled flooring and windows all around. Easy access to the back patio. What a nice place to spend your mornings. 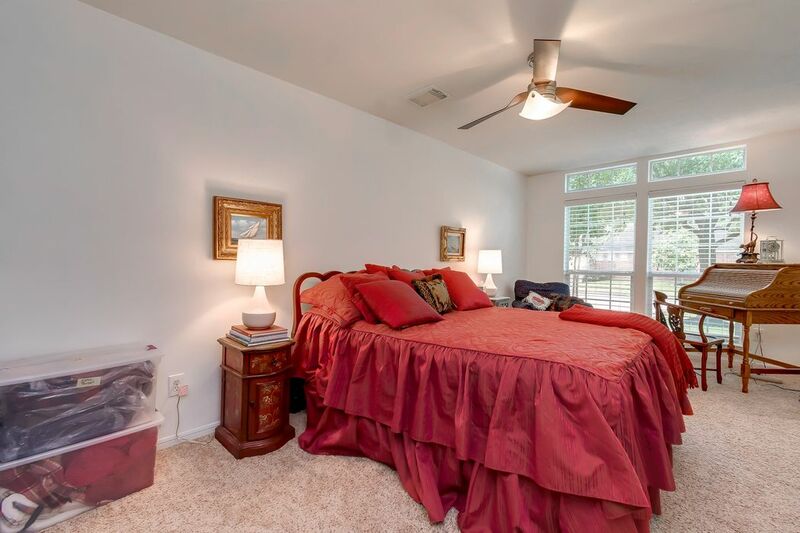 Master bedroom suite with lots of natural light and views. 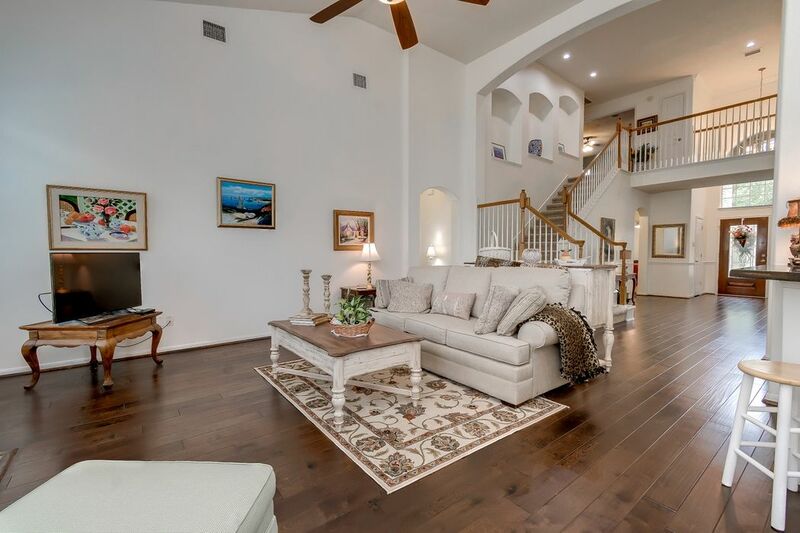 The large room with wood floors offers a nice retreat from the day. View of the large walk in shower with river rock flooring, rainshower head and niches for toiletries. 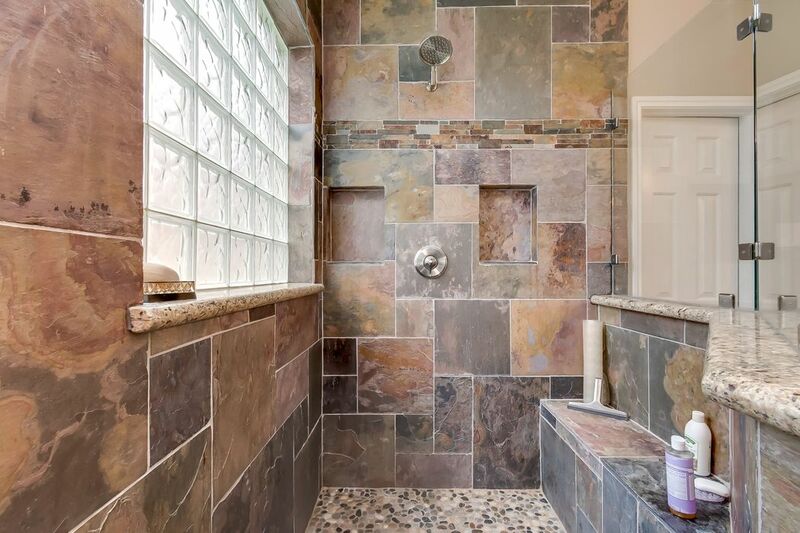 The glass block window offers privacy but lets in lots of natural light for a refreshing shower. Close up view of the walk in shower with 2 shower heads , custom tiling and convenient ledge. 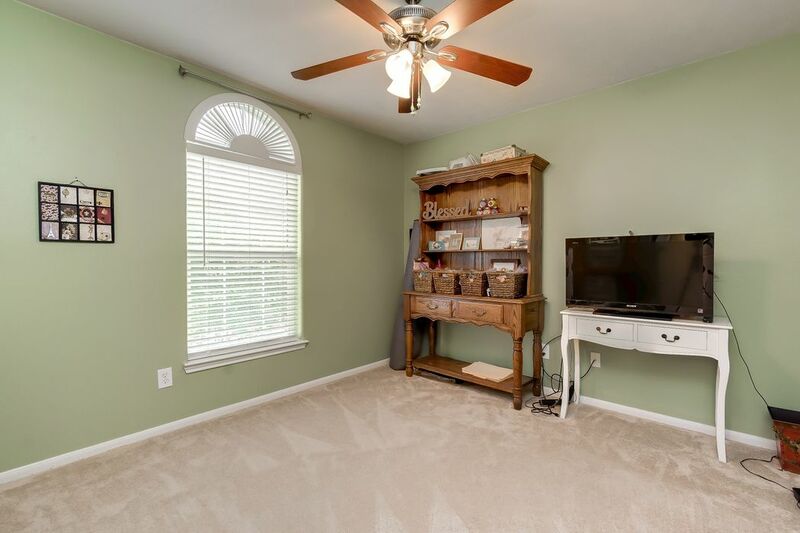 Secondary flex room conveniently located on the first floor. Can be used as study/nursery what ever you desire. 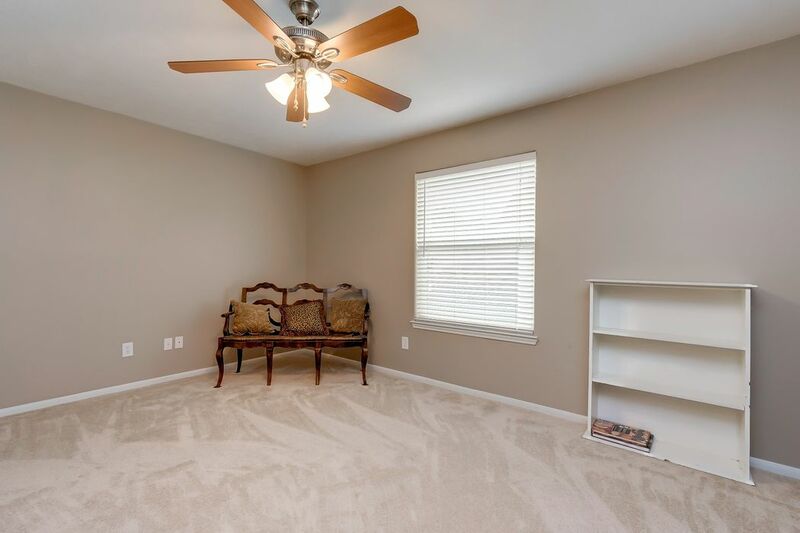 This room features carpeting, ceiling fan and plenty of natural light. Guest bathroom on the first floor very conveniently located off of the foyer. 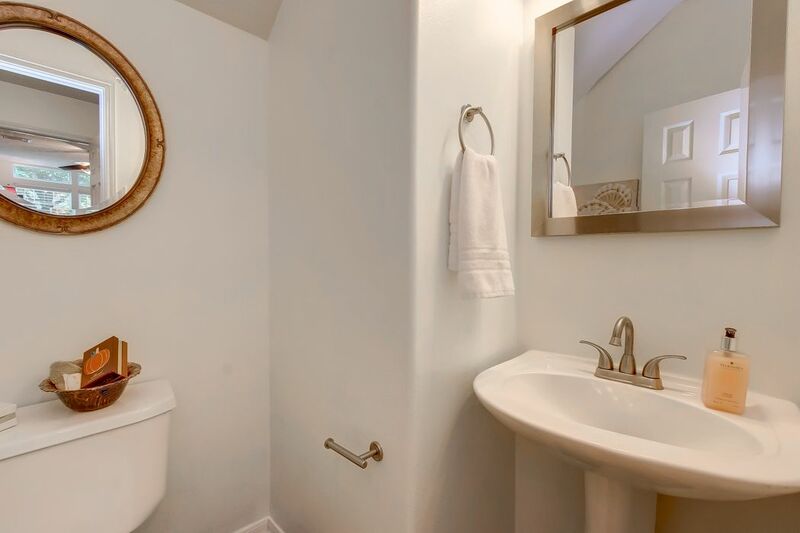 With a beautiful pedestal sink. 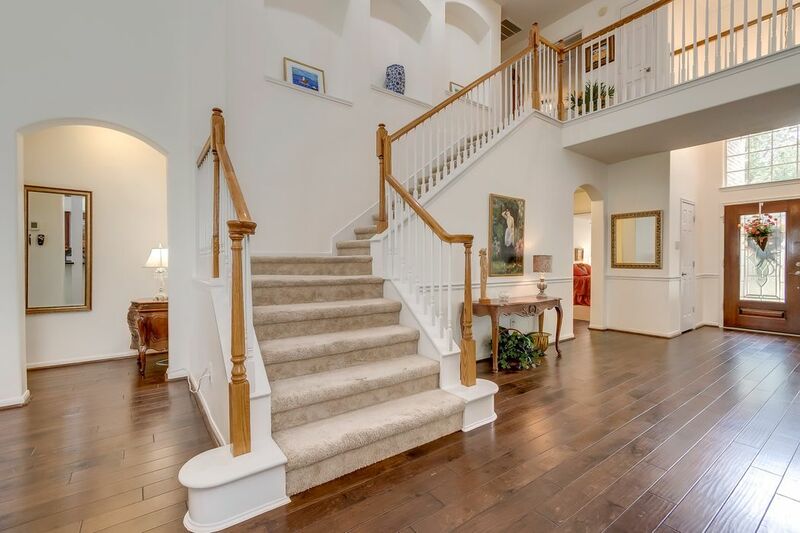 View of the grand entrance way focusing on the stairs leading up to the second floor The stairs have beautiful wood hand rails, wood balusters and large niches for decorative s on the way up. View of spectacular Game room on the second floor. 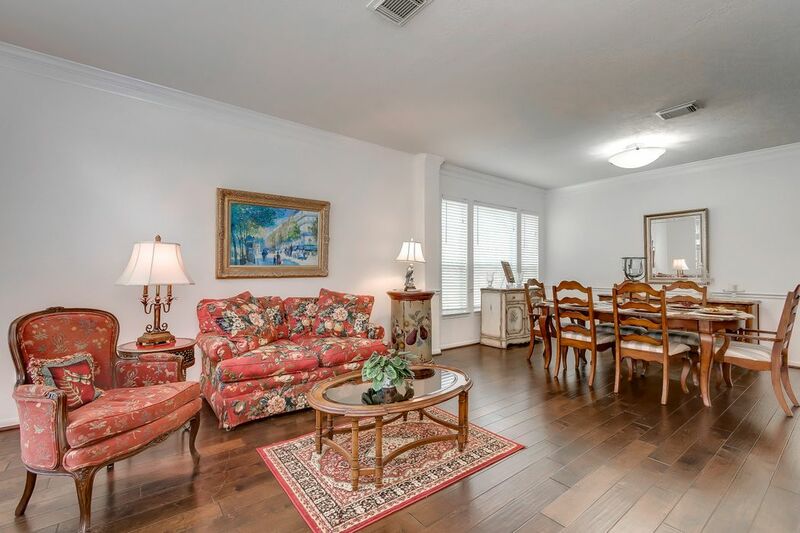 This room is large and accommodate any arrangement. 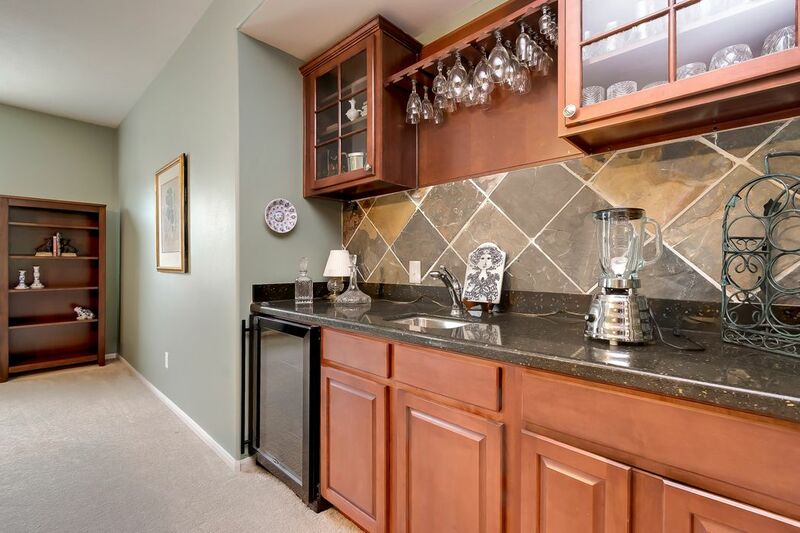 The wet bar has a sink and refrigerator and lots of cabinet space. The room also has french doors that can be closed off for privacy. 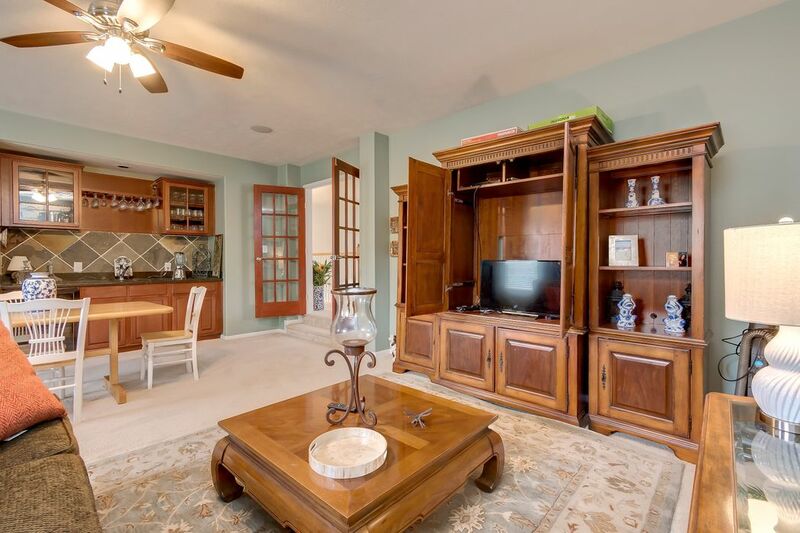 Another view of the Game room showing the french door entry way. View of the game room wet bar featuring the sink and refrigerator. Beautiful wood cabinetry has lots of storage. 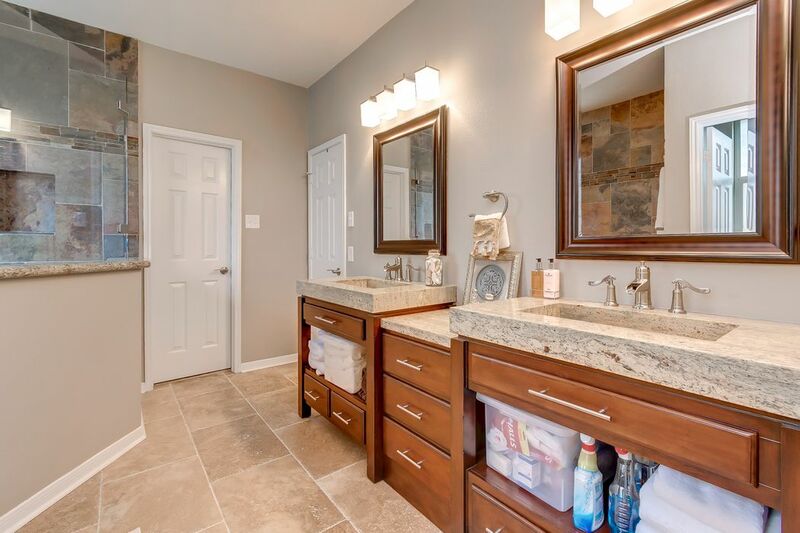 Secondary bathroom on second floor with dual sinks, tub/shower and tiled flooring. 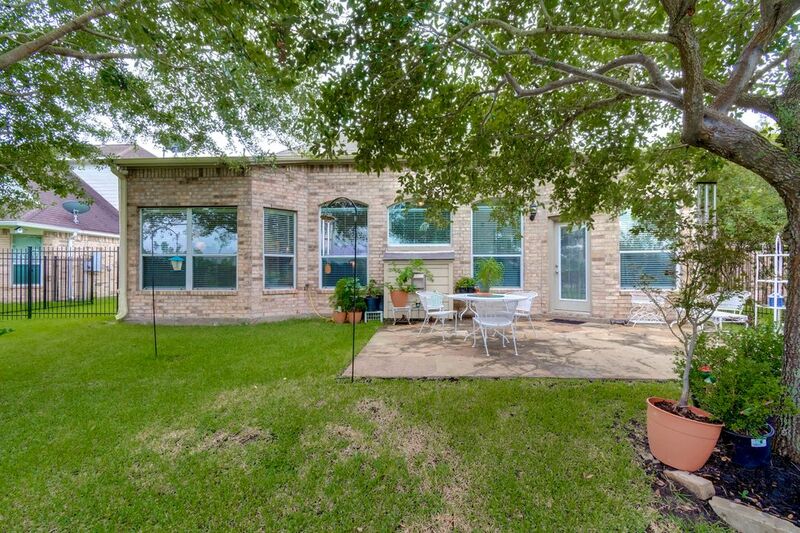 View of the backyard with tiles patio and wrought iron fencing. This backyard offers views of the golf course and lake beyond. 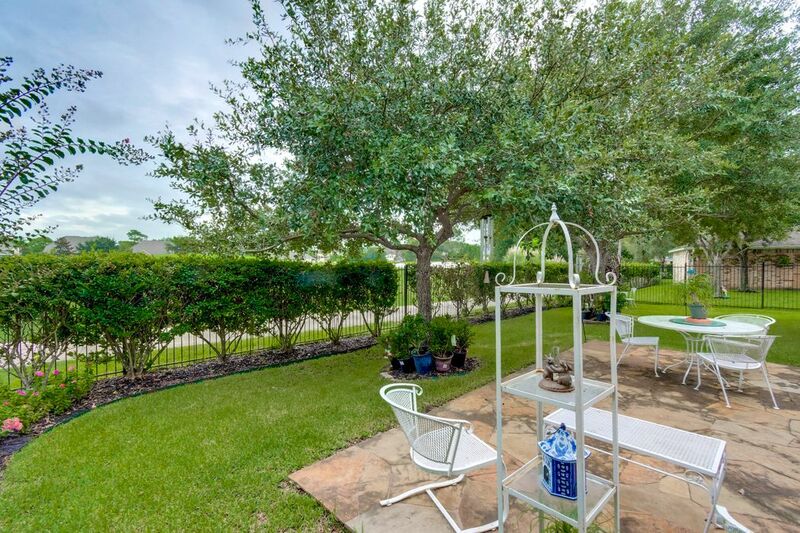 View of the ample backyard with wrought iron fencing and stone patio. What a nice place to spend evenings outside. 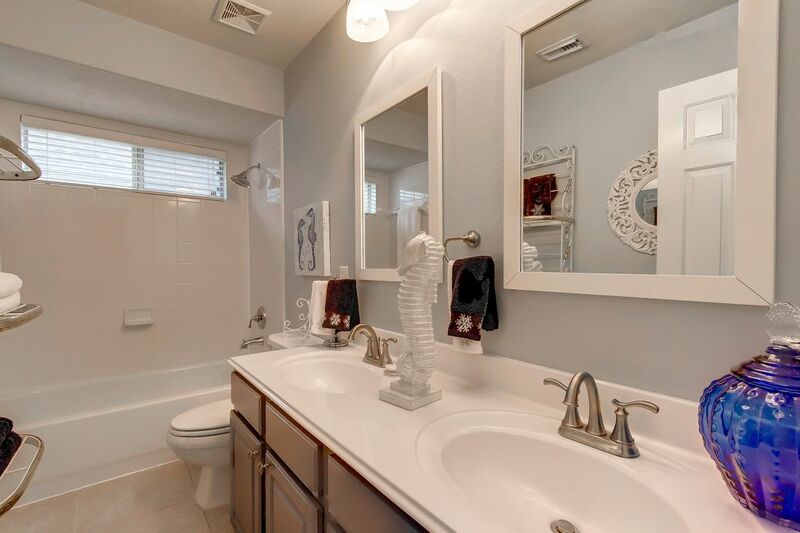 $335,000 4 Bedrooms2 Full / 1 Partial Baths3,561 sq. ft. 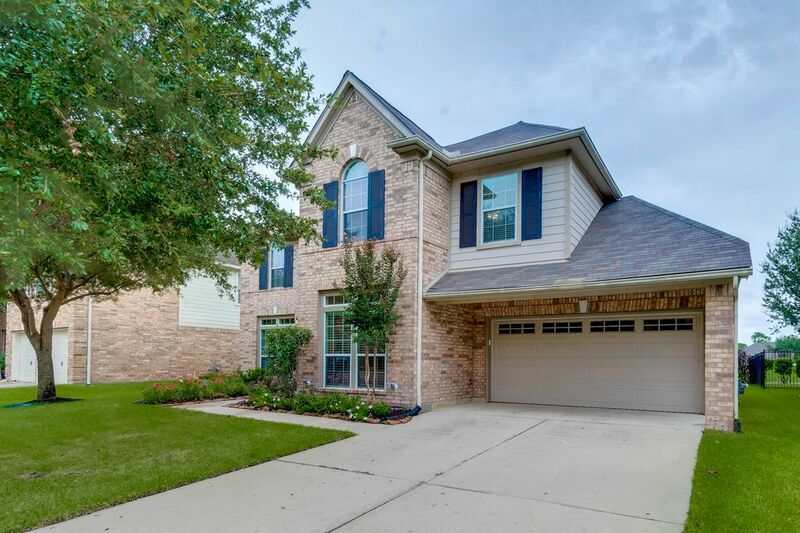 Welcome to this beautiful brick home located on the golf course with stunning views of the golf course and lake.This home boasts an open floor plan with formals.The light-filled great room has soaring ceilings, a cozy fireplace and is open to the beautiful granite-topped island kitchen. 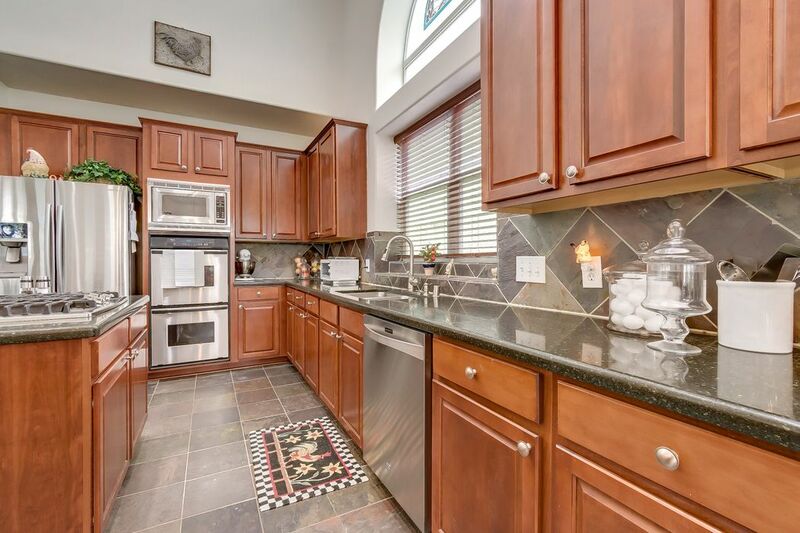 The recently updated kitchen features stainless steel appliances, plenty of storage space and is adjoined by a breakfast area. 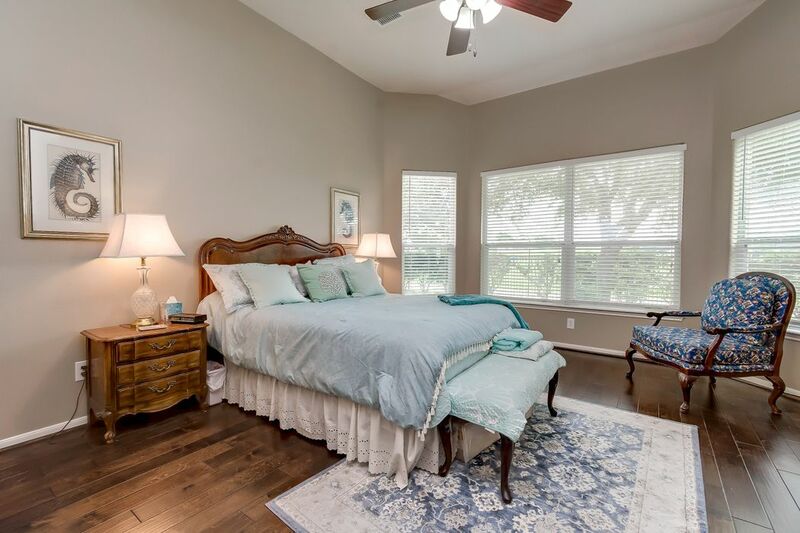 All of these rooms including the master bedroom have views of the golf course/lake and are unified by gleaming hardwoods. 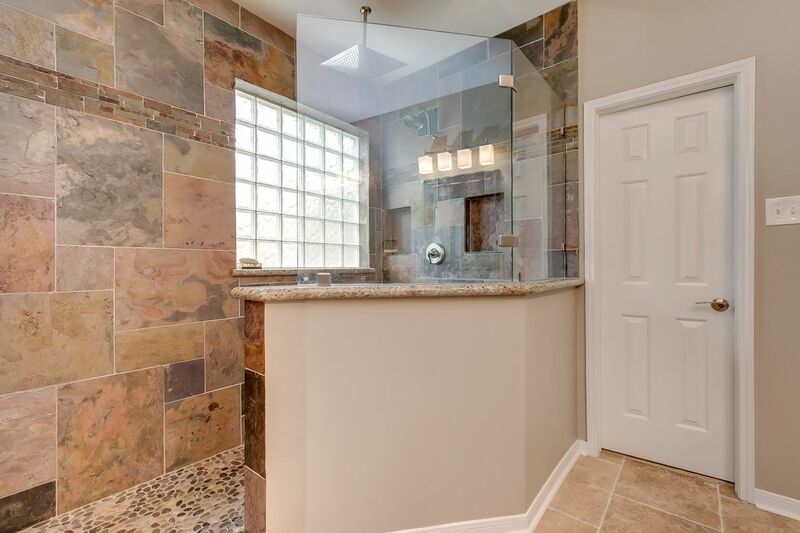 The master suite has been recently remodeled and boasts a walk-in enlarged shower with designer tile. 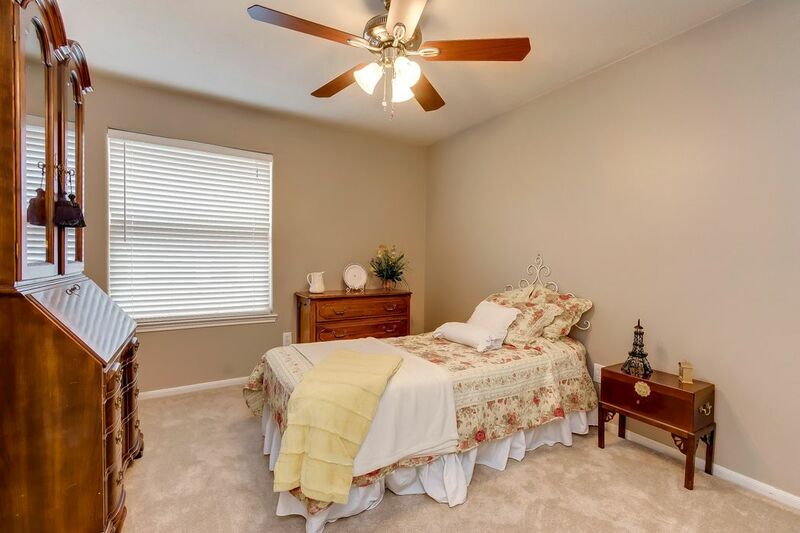 The master bedroom and study are conveniently located on the first floor. Upstairs is the huge gameroom with wet bar and French doors. 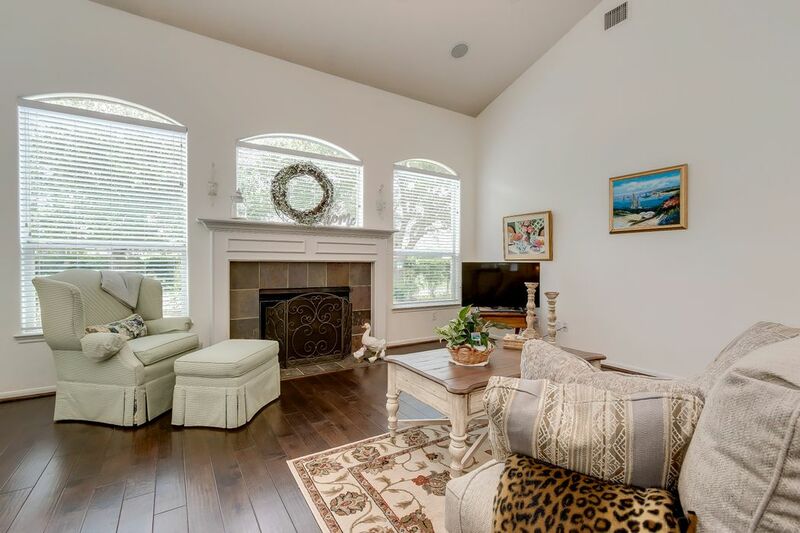 The generously-sized secondary bedrooms all have natural light, carpeted floors and ceiling fans.The large backyard with flagstone patio and lots of shade offers a respite from the day.